You are proud of your truck. As a resident of North Dakota or Northeastern Montana, you’re also likely well versed in the demands that local roads and off-road trails place on your vehicle. One rewarding project that can fully enhance your truck’s handling is the careful selection and addition of off-road parts and accessories. 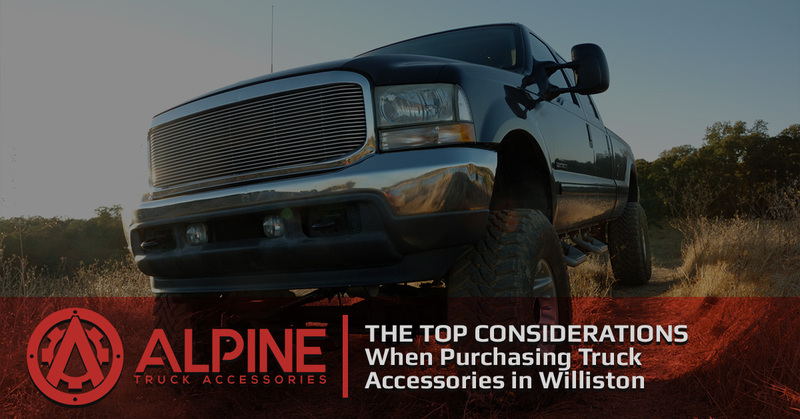 Alpine Truck Accessories is proud to serve as your trusted truck shop in Williston, delivering industry expertise to support our top-notch products. Mother Nature is relentless, and the elements and road conditions across the North all work in tandem to damage your investment. Our team is here to provide the best truck accessories at affordable prices to ensure that your ride is smooth and safe at all times. Simply setting out in the world to procure off-road accessories is not recommend, as there are simply far too many products available. Today, we’ll highlight a few considerations for you to mull over. When you’re ready, be sure to stop by our local truck shop for expert assistance and amazing outcomes! Your truck is a workhorse, taking up a large portion of your time, money, and energy. It’s important to invest in this vehicle in order to invest in yourself. You can think of it as an off-road spa that keeps your body calm and comfortable while you take on the everchanging elements. If you find an off-road part that you are obsessing over, be sure to consider the comfort it adds to the vehicle. Some upgrades may actually make the experience far less comfortable for your riders, so be sure to plan accordingly. As always, our truck shop is here and ready to help! No one can deny the beauty and strength that comes with a fully decked-out off-road machine. From sleek roadsters that aim to be simple and eco-friendly to Jeeps that are rigged for cross-country overlanding, the looks of your vehicle can be upgraded to turn heads on the roadways and trails. Remember that style is a personal preference, and everyone will have their own unique sense of what looks best. Even minor upgrades can result in big visual improvements. You are ready to shred the trail, and you want your vehicle to look as such. Off-road accessories come in all varieties. Drivers can choose from aftermarket bumpers, flares, runners, and off-road tires to create a rugged ride. Alpine Truck Accessories is proud to be your comprehensive provider of off-road parts and Line-X spray services. We know what it takes to take your ride’s appearance to the next level. Despite our passion for what drives us in this world, the financial cost always seems to be a deciding factor in the value and worth of your aftermarket truck parts. Even if a part enhances your truck’s style and functionality, it ultimately may not be worth buying if the asking price is too high. With all of the truck accessories offered by our off-road truck shop, it should be easy to see how you can easily go overboard. Discipline is needed for 4×4 enthusiasts, as the costs will easily add up if you aren’t careful. Crafty consumers will shop around and do their research when looking for quality parts for their trucks. Keep in mind that the best products aren’t always the priciest. Our Williston truck parts are built to last and come at an affordable price. Be sure to browse our truck shop to see for yourself! Ultimately, the top priority for most off-roaders is to find truck accessories that are functional. Every driver has a different goal, making it important for you to find the truck parts you truly want. Jeeps, trucks, and SUVs have a plethora of parts available, each providing unique advantages to tailor to your off-roading needs. Everything from the rims to the roof rack is available, and Alpine Truck Accessories is here to help you every step of the way. Our off-road shop stocks the lift kits, winches, lights, grilles, side steps, body armor, and more to keep your ride protected and stylish. It can also provide a few beneficial advantages in terms of functionality, too! You love 4x4ing, we love supplying Williston drivers with the best truck accessories available; we’re a perfect match! If you live in North Dakota and you are in need of quality truck wheels and parts to optimize your ride, stop by our truck shop or contact us today for help!